Second home developments have been one of the brightest spots in the UK new-build market through the recession and now into the recovery, according to Knight Frank. After a slight decline of 0.4% in 2008 the number of second homes in Britain rose by 2.6% in 2009, to reach record levels of 245,384. Liam Bailey, head of residential research, Knight Frank, commented: “There are several reasons for the faster rebound in demand for second homes following the recent recession. Interest rates are much lower than they were in the early 1990s, which has reduced both the cost of acquiring property and the attraction of keeping money in cash. While credit has been severely constrained for homebuyers requiring high loan-to-value ratios, wealthy investors with large amounts of equity have been able to take advantage of low financing costs. “The recovery from the recession has coincided with a trend for taking holidays in the UK despite a succession of three damp summers between 2007 and 2009. The fashion for ‘staycations’, as holidaying in the UK has been dubbed, has been inspired partly by a weak pound and partly out of environmental concerns. Holidaying in the UK is now widely considered a ‘green’ option, especially when compared with long-haul destinations. “The potential investment returns from holiday lets is also a huge draw. Increased demand for self-catering accommodation throughout the year has enabled buyers to look upon a second home as an investment rather than a luxury. Investing in second homes has been made easier and more attractive by the emergence of managed holiday home developments. Owners do not have to manage lettings themselves: this can be organised for them along with cleaning and maintenance. And buyers can still use the property for their own use for several weeks of the year so get the best of both worlds. “Two main types of holiday home have increased in popularity; firstly, holiday lodges, the upmarket reinvention of traditional caravan parks set in a managed holiday complex with facilities. “The second popular choice is the leasehold apartment set in the context of a managed holiday complex or adjoining a hotel and thus benefiting from the facilities of the hotel. “The market for both types of property is likely to grow as the supply of second hand cottages in popular locations remains constrained. In popular second home hotspots, the supply of property in July 2010 was 20% below its long term average. Meanwhile demand for holiday homes continues to grow and much of this demand is coming from buyers who previously would have bought overseas. 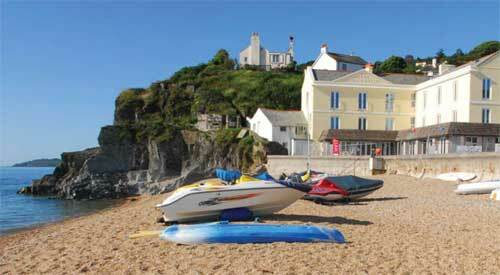 “The tax arrangement for UK holiday homes can be more advantageous than other investment options. While new homes are liable for VAT, where planning restrictions prevent them from being used as main homes, the owner of a furnished holiday let is treated as a trader therefore capital expenditure on the property qualifies for capital allowances. If a property earns less in rent than it costs to run, the deficit an be counted as a trading loss. The new coalition government has said that they will keep the tax advantages of furnished holiday lettings, though it seems likely the rules will change and the most likely long-term outcome will be that properties need to be available for 210 days (at the moment it is 140) and let for 105 (it is currently 70). “The most successful developments are those which maximise year round letting, with occupancies of 30 weeks or more per year resulting in good rental yields. “Our research identifies some good examples in the west country. At The Village in Watergate Bay, Cornwall, a development of 24 eco houses, investors will be guaranteed a gross rental return of £35,000 for the first three years which equates to 4.5% net yield per annum. At St Moritz overlooking Daymer Bay near Rock the hotel offers a full lettings service, offering investors a 5% net rental return per annum for the first two years. Meanwhile at The Bay, Talland Bay, near Polperro, which was formerly a caravan site, there are now 43 luxurious holiday lodges with fabulous facilities including a pool and health club, and a full letting service available providing investors with a yield of 5%. “There is a real opportunity for developers looking to create new schemes. Several coastal resorts have become year round attractions especially where there are quality restaurants, coastal walks, scope for watersports. The conversion of faded hotels into apartments is a popular choice – in some cases the hotel is completely replaced while in others a scaled down hotel operation continues with apartments on site which helps promote year round occupancy. In some cases a flexible format has been implemented, for example at St Moritz in Daymer Bay, Cornwall, investors buy a three bedroom self-contained apartment but when they are not using it two of the rooms can be closed off and used as hotel rooms maximising rental potential. “Also inland locations in open countryside, ideally National Parks or Areas of Outstanding Natural Beauty are desirable holiday escapes. Realistically development is only possible on sites which have already been developed to preserve the areas beauty – former industrial sites, quarries, gravel pits or under-performing caravan parks all work well. “Planners are reluctant to grant permission for old hotels and caravan sites to be redeveloped unless the properties are subject to restrictions which prevent them from being used as main homes. These rules are in place to protect the tourist industry on the presumption holiday makers will spend more on local restaurants and attractions. Meanwhile the other benefit is local people can keep their second hand properties without being pushed out by the second home owners.